Disney artist, Martha Schwartz, has been a fan of The Three Investigators since reading "The Mystery of the Invisible Dog" in 1984. As a budding artist, she liked Jack Hearne's art but fell in love with Harry Kane's Three Investigators work which inspired her to endeavor to become an illustrator of books for children. Later in life she decided to focus on comic book art. Around 2002 she discovered the on-line T3I community and illustrated a number of Mark Zahn's T3I fan-fiction novels which appeared on this site. Martha is a multi-talented artist who paints, draws, and sculpts. You will find some examples of Martha's work by scrolling further down the page. I've only included some of her T3I-related or other series book-related work here. If you are interested in having Martha create something unique for you, please contact her directly HERE. Pictured to the right is the front cover of a 25 page comic book Martha created in 2016 based on the characters and ideas of Robert Arthur. Click on the cover to open and read the comic. Enjoy! 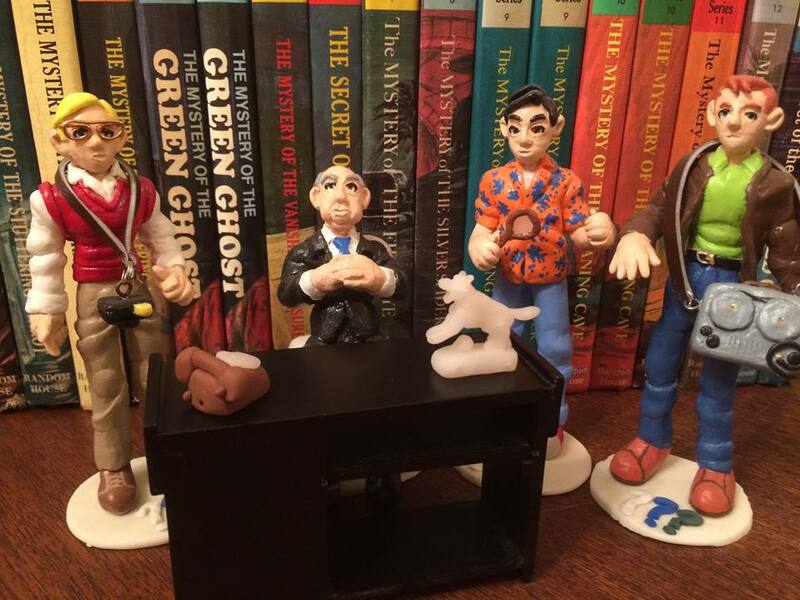 Martha created this set of 6" Alfred Hitchcock and the Three Investigators figurines for www.threeinvestigatorsbooks.com in 2014. Canvas shoes decorated with series book artwork commissioned by fans. Top: Artwork from the German T3I series. Top Right: Artwork from the U.S. T3I series. Right: Artwork from Nancy Drew.